There are plenty of reasons to hit the road and get out of the city. Below, some inspiration for tours and day trips from Vancouver. What surrounds Vancouver is part of what makes it special, so get out and appreciate the beautiful countryside as much as you can. Even if hiking is not your thing, then just go chill out by a lake! Having a car is a huge bonus and will give you access to beautiful day trips from Vancouver. If you don’t have a car, many places are accessible by public transport, or you can avail of an Evo or Car2Go membership to visit surrounding areas. A 30-minute drive from downtown, this small bay in North Vancouver is a popular spot for hiking and kayaking. Quarry Rock is a favourite trail among locals. There are some cute shops and restaurants nearby too, including Honey Doughnuts (favoured by Kate Winslet). Nestled in the mountains north of Vancouver, Whistler is a wonderland in both summer and winter. This world-famous tourist destination is around 90 minutes by car (up to 2.5 hours by bus) along the beautiful Sea-to-Sky Highway. Close enough to be considered for this list of day trips from Vancouver, but far enough away for you to feel like you’re in another world. In winter, enjoy world-class ski conditions at Whistler Blackcomb resort. In summer, there’s world-class mountain biking and hiking trails. The European-style après ski atmosphere and great nightlife are another big draw. Even if you don’t ski or bike, you can still ride the record-breaking Peak2Peak Gondola or take in Crankworx, an international mountain biking festival held in July. This outdoor playground is also the place for white-water rafting, bungee jumping, zip lining, golfing and much more. Spending a day at Scandinave Spa any time of year isn’t a bad idea, either. Hostel accommodation is scarce and hotels are expensive. Apartment rentals can be much more reasonably priced. Photos: take a look at winter in beautiful Whistler. Visit our complete Whistler destination guide. One of the best things about Vancouver is its proximity to the beauty of Vancouver Island. Before you even travel there, you will sense the excitement in people’s voices when they speak about the magic of the Island. The ferry rides are scenic, with great views of the city and the mountains, and lucky passengers may even spot seals, dolphins or orca whales en route. There’s a reason so many commercial Vancouver tours have the Island on their itinerary. Tofino and Ucluelet are a 5.5-hour drive away (including a ferry ride), so make a weekend of it. The ancient rainforest and beautiful beaches, perfect for surfing, storm watching, hiking and whale watching, make this a much-loved spot. Tofino is laid-back, and is home to some great food and drink options. The town of Ucluelet is only 40 minutes away from Tofino by car, and offers cheaper accommodations. Victoria is the capital of British Columbia, and a rather quaint city. If you’re looking for a faster way to travel than ferry, a seaplane departing from Vancouver’s Coal Harbour will take you there in 35 minutes. You could also head north to Port Hardy, or visit one of the many islands off the eastern coast of Vancouver Island. With regular ferries and air services, visits to the Island can be reliably done in a day. But in reality, it’s worth dedicating weeks of travelling as the options are endless. The Gulf Islands are only accessible by ferry or seaplane, so travel time varies based on destination. The closest of the Gulf Islands is Bowen Island, just a 30-minute ferry ride from the mainland. Salt Spring Island is a popular destination, thanks to its hippie-artist vibe and bustling outdoor market. When it comes to day trips from Vancouver, sometimes it’s the journey that makes it all worthwhile, not just the destination. This is the road less travelled, as many people overlook the remote beauty of the Sunshine Coast. The area refers to 139 km of forested coastline, so travel time varies depending on your final destination. This area can only be accessed by ferry or seaplane. A quick ferry ride from Horseshoe Bay takes you to Langdale, a jumping-off point for amazing villages, beaches and national parks. The beautiful towns of Gibsons and Sechelt are surrounded by national parks and coastal views. Another scenic ferry north will take you to remote Powell River. The tiny village of Lund and Savary Island make the trek worthwhile. British Columbia is a hiker’s paradise, so get out and explore the scenery this place has to offer. The Vancouver Trails website has a complete list of hiking trails. Trail Peak has a great search function that allows you to scan trials by difficulty and location if you’re unsure of where you want your tour to take you. The Stawamus Chief is the second-largest granite monolith in the world, and looks out over the town of Squamish along the Sea to Sky Highway, en route to Whistler. It’s about a 40-minute drive from Vancouver, and is easily spotted on the east side of the highway. Also known as “The Chief,” this hiking spot is about a six-hour round-trip, and is a moderate hike in terms of difficulty. The views from the top are amazing, and make the journey worthwhile. If you’re looking for transport, learn more about how you can car share in Vancouver. Situated just south of Whistler, Garibaldi Lake offers breathtaking scenery. It’s nearly a two-hour drive from Vancouver to Rubble Creek (signposted for Lake Garibaldi). The best way to get there is through the nine-kilometre-long Lighthouse Park. For those looking for a mind-blowing full-on hike, try Black Tusk. The peak is a remarkably abrupt pinnacle of volcanic rock located in Garibaldi Provincial Park. It’s a 29-km-long trail, and takes 10 to 12 hours depending on your pace. The last section is extremely vertical, so it’s not for the faint-of-heart. But the 360-degree views from the peak can’t be matched, as you can see Whistler, Vancouver Island and the interior of BC. Push yourself, it’s worth it! It’s possible for this to be a day trip, but if you want to make a weekend of it, camp at Taylor Meadows or Garibaldi Lake. It’s first come, first serve, so arrive early. It’s possible for those seeking day trips from Vancouver, but if you want to make a weekend of it, then you can camp at Taylor Meadows or Garibaldi Lake. It’s first come, first served, so arrive early. 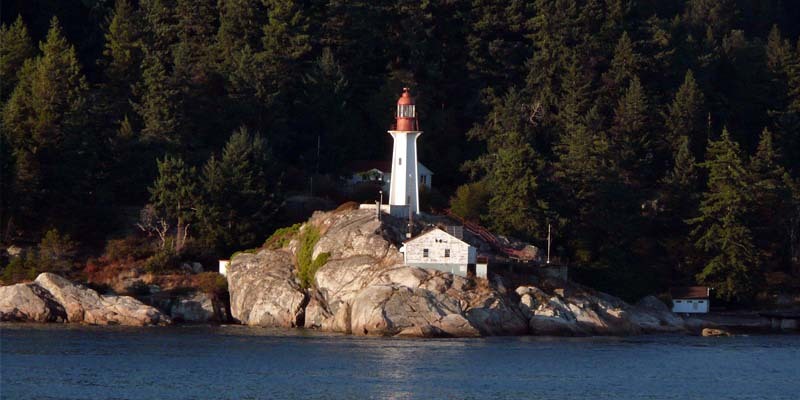 Located in West Vancouver, Lighthouse Park is one of Vancouver’s most accessible trips into the adjoining countryside. It’s around 40 minutes by car or bus and offers some light hiking around various trails, with views of the city and harbour. Most people are more familiar with this place in the winter months, but it also offers great hiking and views of the city during the summer. You can hike the slopes and choose either Black Mountain (there’s a lake at the top) or Cypress Mountain. Be aware: black bears are often spotted around here during the summer. You are spoiled for choice in terms of camping locations around British Columbia. Provincial parks have top-notch facilities, with each camping unit offering parking spots, an area for your tent, fire pits (when fire bans are not in effect), a picnic bench, and shared bathroom facilities with electricity. Forestry campgrounds tend to be more isolated and less family-friendly, but offer fantastic facilities in remote locations around the province. See the BC Parks website for more details.